Raheem Sterling has spoken openly and eloquently in leading the fight against such abuse. Juventus and Italy forward Moise Kean hit back with his celebrations – mocking Cagliari fans for abusing him after scoring against them. Sterling’s England team-mate Danny Rose said he could not wait to “see the back of football” because of a lack of action taken against fan racism. On Wednesday, Manchester United said they “will take the strongest possible action” they can after defender Ashley Young was racially abused on Twitter. Watford captain Troy Deeney disabled comments on Instagram after the alleged abuse aimed at him and his family following the Hornets’ FA Cup semi-final win over Wolves on 7 April. In Scotland, representatives from all 42 league clubs, the Scottish Football Association, Scottish Professional Football League and the Scottish Government attended an anti-racism summit in February. Manchester City forward Sterling has led the way in speaking out against racist abuse, with the 24-year-old described as a “trailblazer” as he was named sportsman of the year at the 2019 British Ethnic Diversity Sports Awards. 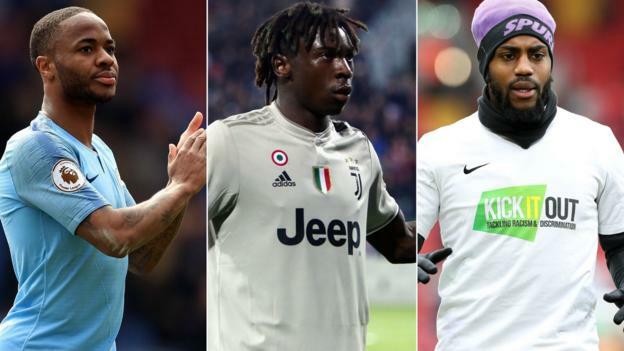 He was among a number of high-profile footballers to use social media to condemn comments from Juventus defender Leonardo Bonucci that suggested team-mate Kean was partly to blame for the racist abuse he received from Cagliari fans.